Acadia is a Francocized (Acadie), and then Anglicized version of the word Arcadia, a district of ancient Greece. Arcadia means "idyllic place" in Greek, and the Italian explorer Verrazzano gave this name to all of the North American Atlantic coast, north of Virginia. Eventually, Acadia came to refer to the French holdings in the New World, including Quebec, the maritime provinces of Canada, and the modern U.S. state of Maine. So for those of you keeping score at home, an Italian guy gave a Greek name to Native American land, which was then colonized by the French, lost to the British, and eventually became one of the United States of America. Whew! Some day I'll tell you how the Acadians - refugees from the war lost to the British - made it all the way to New Orleans to become the Cajuns. 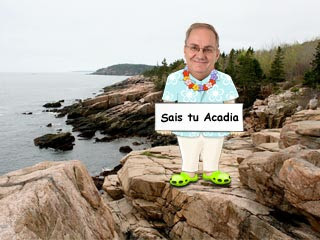 Nowadays when you say Acadia, most people think of Acadia National Park in Maine, from where I am writing to you today. But even this place has been through several name changes of its own. It is the ancestral home of the Wabanaki tribe, and was simply known as the "dawn lands" since this is the easternmost part of the North American continent, and the first to see daylight. After the aforementioned colonial misadventures, the name Mount Desert Island was given to the land that comprises the bulk of the modern park. It - and the surrounding islands - was officially granted federal protection by President Wilson in 1916 as Sieur de Monts National Monument. In 1919 it became the first national park east of the Mississippi River, with the new name of Lafayette National Park. This was in honor of Marquis de Lafayette and his efforts on behalf of the American Revolution. Finally, in 1929 the park's name was changed to Acadia National Park, and to my knowledge, there are no plans to change it any time soon. Whatever you call it, it really is an idyllic place. In total, the park encompasses 47,000 acres (small by national park standards) and is comprised of mountains, ocean shoreline, and woodlands. It is home to over 40 species of mammals (including beaver) and boasts a variety of deciduous trees like aspen, birch, maple, and more. To many visitors - over 2.5 million a year - the beaver and the changing of the leaves represent what Acadia is all about. But these are fairly modern occurrences. The beaver was basically hunted to extinction in these parts, until two breeding pairs were released in 1920 by a fellow named George Dorr. Starting from there, their population crept back over the next two decades. Then in 1947 a devastating fire consumed nearly half of the coniferous forest in the park. In its place grew the leaf bearing trees we know and love today - which the beavers prefer. Both populations boomed, and "leafers" and beaver lovers alike are all the better for it. But the park is so much more than just fall foliage and wildlife. In addition to hiking trails, campsites, lake and ocean fishing, and horseback riding, the park is home to over 50 miles of gravel carriage trails. For approximately fifteen years, billionaire philanthropist John D. Rockefeller, Jr., financed the construction of the paths, along with 17 granite bridges, 2 lodges, and acres and acres of plantings along the paths. The latter were lost in the fire and have since been replanted, but the rest remain as a testament to his commitment to this majestic place. Visitors can walk, bicycle, or take a guided tour of the park via these paths, which are edged by cut granite stones - known locally as "Rockefeller's Teeth". I am staying at a timeshare resort called Harbor Ridge in the village of Southwest Harbor. It's a lovely little collection of townhouses with mountain and island views, just minutes from the park. I actually own this week here, and use it as a yearly pilgrimage to the park. The summer crowds have gone and the leafers are still a few weeks away. It's quiet, cool, and peaceful. And since I am still recovering from last week's poison ivy incident, the perfect retreat. There are no timeshare rentals here at this time, but you can sign up for a posting alert and be notified when one does come up. Well I am off to The Wendell Gilley Museum, located right here in Southwest Harbor. If you are not aware, Wendell Gilley was a pioneer in the field of decorative bird carving, and author of the seminal work, Art of Bird Carving: A Guide to a Fascinating Hobby. Unlike decoys, decorative carvings are not functional, and Gilley's pieces in particular resemble their real life counterparts in spookily realistic detail. I fancy myself an amateur carver and want to have a look at his woodcock for inspiration. It's a bird, people.